Nothing quite says friendship like hooking up with your BFFs and brutally murdering someone. Digitally, of course. In what seems to be a growing (and welcome) trend in gaming, more and more developers are putting a fair amount of effort into creating a satisfying co-op experience that supplements rather than just recreates the overall experience. Some do that through a tailored drop-in/out co-op throughout the main campaign, while others create a separate experience for gamers. The Darkness II is opting for the latter option, and has announced that it will feature a new co-op mode called “Vendettas,” which will allow up to four players to experience a side story that adds to the overall campaign, but exists separately from it. Along with the separate, narrative driven missions, there will also be a new game mode titled “Hit List,” which lets you repeat sections of the campaign as well as a few new scenarios. • Inugami:Wielding the mythical Kusanagi samurai sword rumored to have killed ten thousand innocents, Inugami is a dark and mentally unstable character with revenge-driven motives against The Brotherhood and their allies for the slaughter of his entire family. He can also use a swarm of miniature demons to attack and immobilize his enemies (pictured above). • Shoshanna: Shoshanna is an ultra-efficient agent for Mossad, the Israeli Intelligence Agency, who was sent to New York to combat a spike in Brotherhood activity. Her obedience and devotion to her superiors makes her a perfect operative, and she harbors a passion for hunting and destroying evil in the world as part of her legacy. Shoshanna wields the Arm of the Night, a powerful weapon fueled with Dark essence and the power to fire multiple rounds of gunfire at one time. • Jimmy Wilson: A product of inner-city Glasgow, Scotland, and a notorious alcoholic, Jimmy believes The Brotherhood is simply another form of the Hated English that persecuted his family in the past, and he travels to New York to torment them to the fullest extent. He wields the Dark Axe, and has the ability to summon Darklings that he commonly refers to as “Little Jimmys”. • J.P. DuMond: A former doctor from New Orleans, DuMond is burdened with guilt for using a form of Louisiana Voodoo to heal his patients. The use of dark magic drew the attention of The Brotherhood, an organization which J.P. is now forced to combat in order to halt their pursuit of evil relics. J.P. wields the Midnight Stick and can pull enemies into an anatomy-crushing vortex when he tosses his Box of Tricks – a black metal box filled with dark power – into an open area. 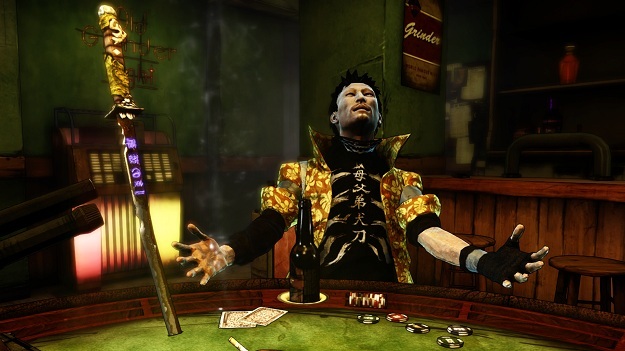 You can check out all the new game modes when The Darkness II is released for the PC, Ps3 and Xbox 360 on February 7.